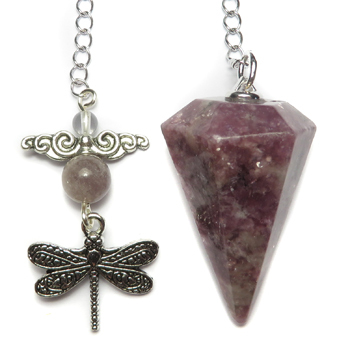 Lepidolite pendulum with Quartz and Lepidolite beads, pewter spacers, and a pewter Dragonfly charm. Comes with a velveteen pouch. You feel emotionally shut down and want to free up your energy and expressiveness. Your life feels stagnant and you need a change of pace. A situation or relationship seems clouded with illusion or falsehood, and you want to get the truth of what's going on. You're feeling drawn to study any mystical art or ancient mystery schools. Lepidolite: A “stone of transition”, assists in the release and reorganization of old behavioural and psychological patterns, gently inducing change. Brings deep emotional healing, soothing and reducing stress and depression. Dissipates negativity and insists on being used for the highest good. Activates the throat, heart, third eye chakras and the intellect. Opens the crown chakra, clearing blockages and bringing cosmic awareness. Facilitates astral travel and accesses the Akashic Record. Helps to take you forward into the future, tuning you in to thoughts and feelings from other lives that are creating a blockage in your life now. Aids in overcoming any kind of emotional or mental dependency, supporting in the release of addictions and complaints of all kinds, including anorexia. Encourages independence and self love and trust. Combines its power of objectivity with direction and unimpeded communication, focusing on what is important and making it an excellent stone for business pursuits. Also relieves exhaustion and aids in the relief of tension and related disorders. Helps to stabilize mood swings and is excellent for menopause. Excellent for bipolar disorders. Chakra(s): Third Eye, Crown.